The crucial tool of woodcutters just won’t cut it when it gets dull. Learn the know-how you need to hone it here. 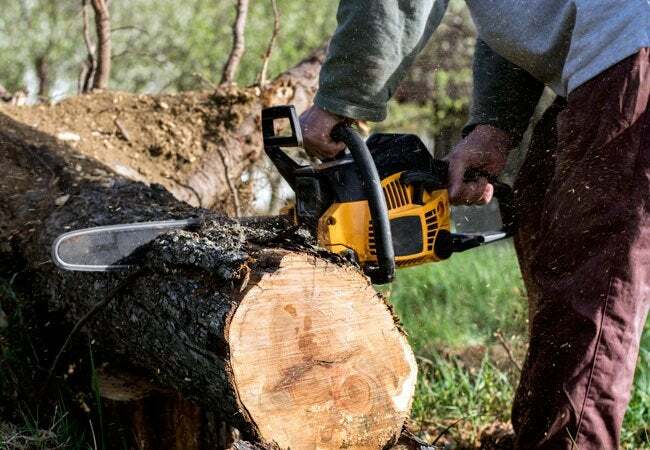 Whether you’re a timber worker or you’re just interested in cutting your own firewood, it’s vital to maintain a professional attitude towards the use and maintenance of your chainsaw. As dozens of cutter teeth chew through dense wood, they’re bound to become dull, reducing the tool’s effectiveness and making it more physically demanding for you to control. Regular sharpening, accomplished by filing, will keep your chainsaw purring like a very rugged kitten. 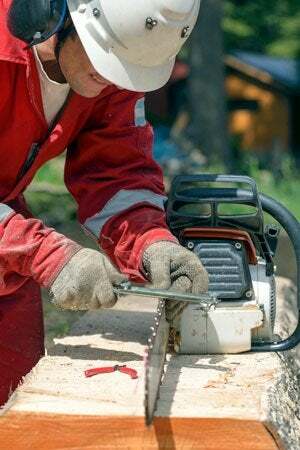 Before you attempt the task, read on for the ways and means of proper chainsaw sharpening. Familiarize yourself with the parts of the sawchain by studying the detailed diagrams in your owner’s manual. In addition to links and straps you’ll see numerous cutters, the focus of the sharpening process. Each cutter has two sharp areas, one on the edge of the top plate and the other on an outside plate where it intersects the top plate. In the middle of the cutter is a notch, known as a “gullet,” and on the other end is a hook-like protrusion. The hook, sometimes called a “raker,” is a depth gauge that determines how much of a bite the cutters take out of the wood when the saw is operating. Sharpening a chainsaw’s cutters and filing the depth gauges allows for optimal cutting. Keep in mind that the shape and size of chainsaw cutters vary slightly from model to model but all are honed in the same manner. The old rule was to sharpen a chainsaw when it produced more wood dust than wood chips while in operation. The smarter move is to sharpen the cutters before that point. If you adopt a routine of sharpening every second or third time you fill the chainsaw with fuel, the sharpening process will be minimal and you’ll never have a dull sawchain. Hold the chainsaw steady on a mounted vice while honing the cutters. If you’re going to be in the woods all day, consider a tailgate-mounted vice that will allow you to stabilize the saw to sharpen on-site with ease. 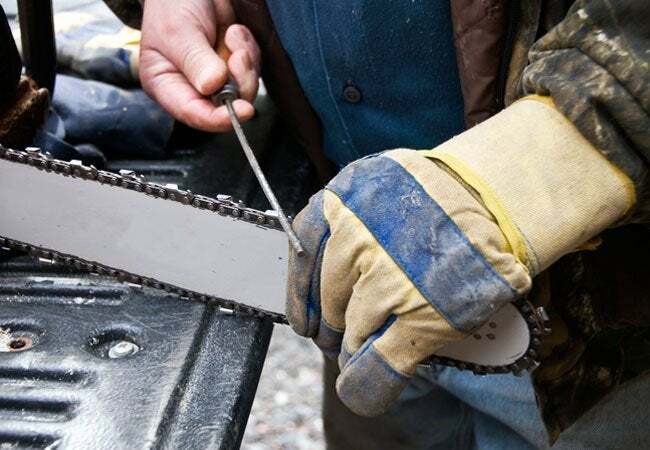 The sawchain, with its dozens of sharp cutters, can scratch or cut bare skin, so put on heavy-duty work gloves, preferably leather, before you start. You’ll also need a good pair of safety goggles to protect your eyes from shavings. A round file is most commonly used to sharpen sawchain cutters, and the standard diameter of most files used for this purpose range from 4mm to 6mm. But not all sawchains are the same size. Check your owner’s manual for the optimal file diameter to sharpen your sawchain. A lot of timber cutting is done away from home, so remember to bring your sharpening tools with you. Otherwise, you’ll be heading back before you’ve filled your pickup bed with firewood. To get the sharpest cutting edge, file from the inside edge of the cutter, toward the outside edge. Sawchains feature both right and left cutters, alternating from one side of the sawchain to the other. To file the individual cutters, position yourself on one side of the saw bar and file the cutters on the opposite side of the sawchain. For instance, if you’re standing on the left side of the saw bar, you’ll file the cutters on the right side of the sawchain. When you finish with one side, move to other side of the saw bar and file the remaining cutters. A round file sharpens in one direction only—on the stroke away from you. To sharpen the cutting corner (the spot on a cutter where the sharp top and side plates intersect), hold the file horizontally and follow the factory angle of the cutting corner as you lightly but firmly push the file. Then lift the file up to return to the starting position and push it again. Use the same number of filing strokes, and the same degree of pressure, to file every cutter. It may take as few as two strokes per cutter to hone the cutting corner, but it could take more if the cutters are very dull. If you’re not confident filing the factory cutter angles, use a sharpening guide. These inexpensive tools resemble rulers and feature a bracket on the bottom that holds a round file. Handheld models go for under $10, but if you’d like more help, opt for a guide that clamps securely on the chain bar. The guides come with pre-marked lines that allow you to align the file at the correct sharpening angle, usually around 30- or 35-degrees. 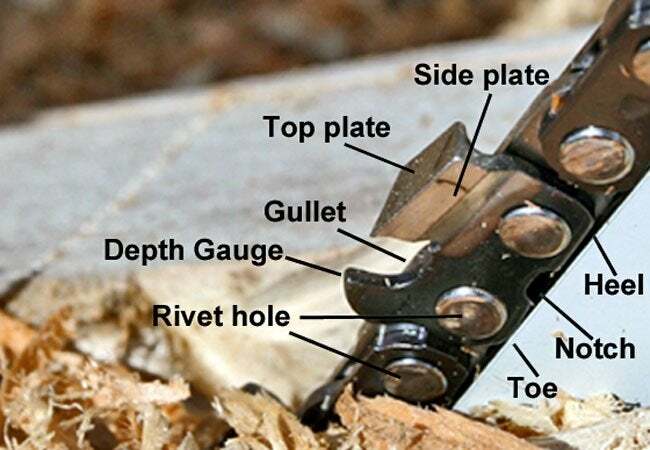 Check your owner’s manual for the correct filing angle for your sawchain. Depth gauges also require filing, though not as frequently as the cutters. Over time, both sawing and filing take a toll on the cutters, wearing them down until the depth gauges (which stick up in front on each cutter) are too high. This can make sawing ineffective, because the depth guides actually block the cutters. You can file freehand, straight across, with a flat file, or purchase a depth gauge guide that fits between the cutters and features an opening that lets you file the top of the depth gauges. The top of the depth gauges should be just a hair—0.025-inches—below the top of the cutter’s cutting corner.